In this post, I wanted to share with you an inspiring story a reader shared with me. This is a young woman from Ireland who had tried something unusual in order to meet new friends. First of all, she found herself in a place where we all find ourselves from time to time. She wanted to go out, dance, and have a good time, but none of her friends felt like it. 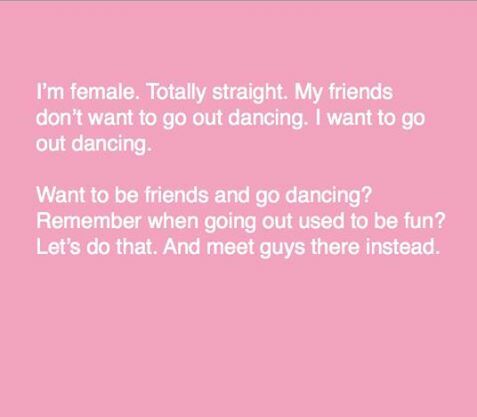 Feeling disappointed and bored, she started to play with the Tinder app… then she got the idea of trying this: she changed her gender to male on the app… and she put a little pink text picture that said that she’s female, she’s straight, and she just really wanted to go out dancing. She thought she might find two or three, maybe four girls that wanted to go for it… but the messages came in from dozens and dozens of people… she was shocked! I was really amused to read this – it’s a clever idea when you think of it. It goes to show you how people these days crave friendship, and not just dating. This is a connected age where people find that they have neglected their social lives. This is why I recommend that you build solid social habits where you always keep a social life going; no matter how much work you have, and no matter how digitally connected (or distracted) you are. In order to keep a social life going, you need some habits of: 1. meeting new people, and 2. keeping in touch and making plans. If you do the former once a month, and the latter, once a week, that goes a long way. Of course you’ll have to be consistent about it. It pays off with a very fulfilling social life – with friends who you really want to keep. In my eBook, Get The Friends You Want, I teach you how to do just that, and a lot more. Go ahead, give it a try and begin your socially active (and awesome-friends-filled) journey.